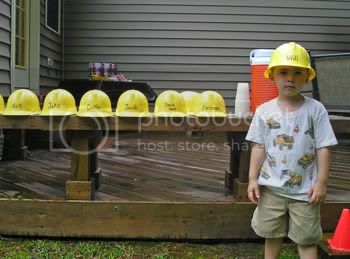 Since Will loves to play with trucks, we decided to have a Construction Party for his 3rd Birthday. This turned out to be lots of fun to plan! The first thing I did was settle on an invitation. I love this one by Cross-My-Heart because of the cute measuring tape ribbon. The wording was cute--things such as "We Break Ground May 16th" and "Need to call in sick? Contact Foreman . . .". Decorations: We kept it simple with black, orange, yellow balloons and then roped off a play area with Caution tape from a hardware store. We also used some of the tape on the mailbox and cake table. Food: We served lemonade in an orange water cooler and gave out Brown Bag lunches filled with ham/cheese wrapped in wax paper to serve as plate, bag of chips, juice box, and an apple. I tagged each child's lunch with a hard hat name tag that I found in the teacher section of the Dollar Store. Activities: Each child received a yellow plastic hard hat with his name on it (my husband also had a hard hat--"Foreman") Also, we asked each child to bring his favorite truck so the kids really enjoyed just playing. I found these fun Inflatable road signs from Oriental Traders and placed them in the yard so they could send their trucks in the right direction. We also had a water table filled with sand and mini construction vehicles and some cardboard bricks for the kids to stack for buildings. Cake: We made a "dirt" cake out of pudding, coolwhip, oreos, and gummy worms and placed it in a cleaned Tonka dumptruck bed lined with plastic wrap. Favors: Most of our favors came from Oriental Traders--Road Sign Lollipops and Construction stickers. I also found some Tonka coloring books at the Dollar Store along with some truck-themed treat bags.